Have you ever dealt with a really obstinate person – a person whose mind is made up and no amount of reasoning or arguing will ever change it? How do you feel when faced with that kind of exchange…what do you do? In our study of the Gospel of Luke this week we’ll be reading chapter 22:63-71. 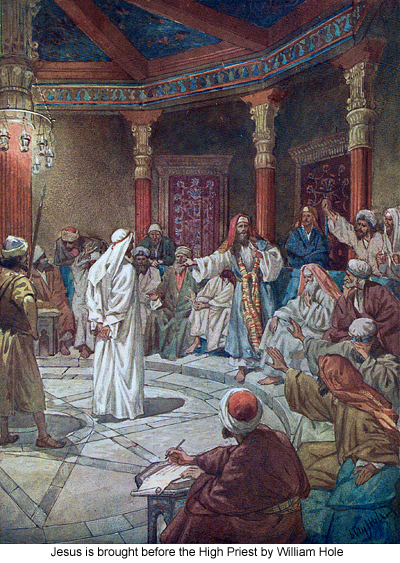 It’s the account of Jesus’ trial before the Sanhedrin, the highest Jewish authority of the time. Much is revealed about the nature of who Jesus is in this account, yet surprisingly Jesus says very few words. He’s beaten by soldiers and interrogated by religious leaders – both groups doing their best to provoke a desired reaction from him, both failing. What IS revealed is that there are actually two courtroom scenes in this section, one seen and one invisible to the naked eye. In a masterful literary setup, Luke presents the irony of one group assuming a position of power over One who is actually judge of all. Jesus makes the statement in v69 that identifies him as one holding equal power and right to rule with God, and that seals his fate in their minds. Its a strange scene where God is in the hands of angry sinners (with apologies to Jonathan Edwards). Hebrews 12:3 says ” Consider him who endured from sinners such hostility against himself, so that you may not grow weary or fainthearted.” – in other words, look at Jesus’ example of how he behaved when faced with closed minded, intolerant people, and learn how you can handle people like that. As you look at Jesus’ behavior during this unjust trial, what do you observe about him and how he did or didn’t react? Who’s opinion of him does he point to as having ultimate importance? – that is, who’s opinion of him matters most? What can we learn from that when people don’t like us or misunderstand us or have a low view of our worth? Stuff to think about. Hope to see you Sunday! I might be off base, but it seems to me the real reason the authorities, religious and otherwise are questioning and after Jesus is to change His mind. “Just tell us you were wrong and not the Messiah”. Deny who you really are, admit that we are right and You were wrong. If you will simply do this little thing for us we can forget the whole dying thing and go out together and get some deli. Of course Jesus simply remains silent because He has already said all He is going to say. Argueing with fools will not accomplish much. Actions will speak louder than words. Whenever I read the words in my bible study or during our sunday meetings I have a tendancy to think “How does this relate to my life, or to the times we live in?” I wonder how many of us both as individuals and as a group of Jesus followers are being asked everyday to simply agree with a group of “fools”, to say yeah ok this Jesus stuff is pretty hard to believe and maybe you could have a point, or even you are right. Do we (I) defend Jesus by following his example and keep silent, but walk with Him every step to the cross everyday, and love even those who crucify us to the point of our (my) own death. I was in a situation this week where I was concerned about other’s perception of me , my intentions. I knew what they were, but there was certainly this sense that they did not. This was disheartening. I started thinking about similar circumstances in the past, and had an epiphany, jeesh, I’ve been here before, worried about other’s perception of me. I just think it an amazing thing that Jesus really was so unencumbered by this. Their perception of him was of little consequence. I love how God knows what we need, as during my morning reading, John 2:24-25, “But Jesus would not entrust himself to them, for he knew all men. He did not need man’s testimony about man, for he knew what was in a man”. Whose validation do we need? Many years ago , someone accused me of being a phoney, my reply surprised even me ( and I can’t take credit for it), when out of my mouth came, “Man looks at the outside, but God looks at the heart”. I turn the title backwards, Angry Sinners in the Hands of God, and know for sure that will not be a nice situation if there is no repentance. God in the Hands of Angry Sinners was ugly, but underneath the ugliness was beauty for me and you.